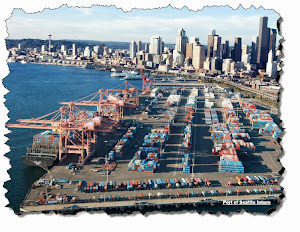 For the past four years I have been talking one class a quarter towards a Masters in Infrastructure Planning and Management offered by the College of Built Environments at the University of Washington in Seattle. This program is very unique, the classes are entirely online, and I've not seen one like it in my global travels. It is a fantastic program covering a broad range of critical infrastructure issues (e.g., transportation, water systems, emergency management, etc.) and also offers supporting training in areas such as capital budgeting/finance for government. Overall I was very impressed with the faculty and level of education. Well, the end is in sight! The final assignment due this week is to submit the final Capstone and also prepare a summary presentation on YouTube the Capstone contents (in 10 minutes!). 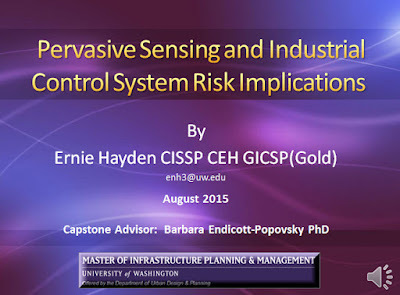 The title of my Capstone is: Pervasive Sensing and Industrial Control System Risk Implications. I hope you will find this presentation informative and though-provoking. Lastly, apologies to those of you made aware of this presentation via a separate Twitter and LinkedIN announcement a few days ago.